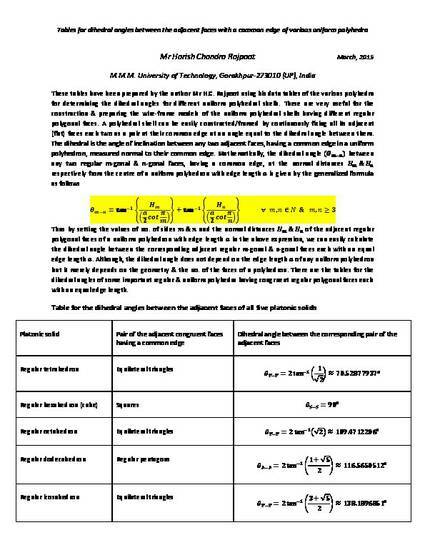 These data tables have been prepared by the author Mr H.C. Rajpoot by using his data tables of the various polyhedra for determining the dihedral angle between any two adjacent faces with a common edge of different uniform polyhedra or polyhedral shells. These are very useful for the construction & preparing the wire-frame models of the uniform polyhedral shells having different regular polygonal faces. A polyhedral shell can be easily constructed/framed by continuously fixing all its adjacent (flat) faces each two as a pair at their common edge at an angle equal to the dihedral angle between them. These tables are very useful in analysis, designing & modeling of various uniform polyhedrons.